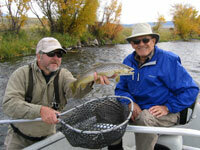 If you had the good fortune to fish the Madison in 2004 then you already know how great the Madison River is fishing in recent years. Our memories are filled with reflections of shared days of chasing trout, enjoying nature, and having a great time with friends. Yes, if one could be satisfied in these respects, the Lady Madie certainly has been quite obliging. June saw the Madison in great shape all month long. 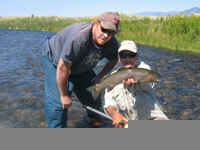 The West Fork was blown out for a few days, with river right fishing well down to Windy Point as usual. The fish were keyed in on stone fly nymphs, flash back pheasant tails, serindipities, and lightning bugs. 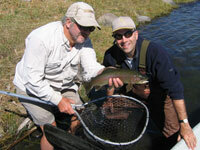 We experienced some excellent dry fly action as well. The salmon fly hatch was in full swing by the third week accompanied by giant golden stones, yellow sallies, little olive stones, and caddis. We very much look forward to June and all she can provide. 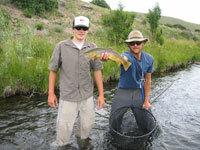 The dry fly action was really heating up by the first of July. The salmon flies were pretty much over around the 4th or so. 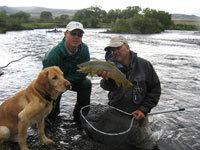 With giant golden stones, yellow sallies and PMDs making a showing, we were soon asking, "salmonfly who"? Caddis were also thick and plentiful all month. The fish made use of the prolific hatches which in turn made the fish happy, and it is to my understanding that a happy fish is a fat fish. You really don't think they buy into that low carb thing, do you? 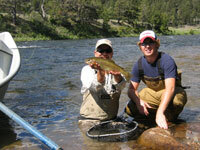 The month of July was certainly an accurate gauge for the dry fly action still to come. The hopper fishing got it going on in August. It was just plain crazy some days. In the right conditions it could become downright unbelievable. 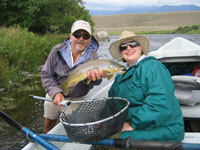 Fishing on the Madison in August 2004 should be the benchmark for hopper action. That is just about all that needs to be said for such a memorable month. September is always one of my most favorite months to be on the Madison. This past year was no different. It starts to cool down, the temperature, not the fishing. The foliage changes to shades of yellow, orange, and red. There is a crisp feel to the air and the trout know that now it the time to forage and make the most of the season to prepare for the coming winter. Hoppers and ants were on the menu and the diners came to the table with a healthy appetite. The season was just about done in October. We had some beautiful Indian Summer days that were enjoyed and appreciated by all. The browns were aggressive, streamers and nymphs being their target. 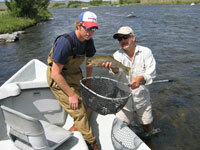 We were also able to coax a few to the surface with hoppers and stimulators on warm afternoons. The bite was generally a more narrow window, usually during the warmest hours of the day. At this time of year we look forward to the 2005 season. We have had a heat wave (in the 40s) the last week or so of January and this gets us in the fishing mode. Fish have been sippin midges on calmer days in the slicks. Fishing fever seems to hit with the rising temps. We expect "winter" to make a return soon and bring us back down to reality. 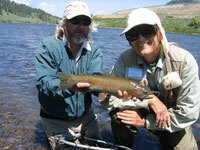 The season really gets going the third Saturday in May when the Madison opens to fishing below Quake Lake. Come join us this season for what should be another great year! ...with a couple of beauties. Joe Moore and big bad Conner with a big bad brown. Goose with his 21" atonement... right Goose? Becky Thomas and what you come to Montana for. Chris Laclair connects with a September rainbow. Dan Price returns in fine form with a nice brown.